Thursday at noon the Metro Board is holding a workshop on the recent audit of the security contract it has with the Los Angeles County Sheriff’s Department (LASD). The unit of the LASD that handles the contract is known as Metro Transit Services which has an online presence on Facebook, Twitter and nixle. In 1997 Metro’s Police Department was replaced by a partnership of the Los Angeles Police Department and Los Angeles Sheriff’s Department. Then in 2003 when it was due to be renewed LASD was able to freeze out the LADP and take over the entire contract, which they have held since that time via periodic renewals. For the period of July 2013-June 2014 LASD received $83,855,638 for the contract. Earlier this year, I was elated to learn (via this comment made by taipan85 to my piece on the Metro fare restructuring proposal) that an audit was underway in response to a motion (#21) made in June 2013 by then Metro Board member Mel Wilson. At that time, Wilson was chair of the Metro Finance, Budget and Audit Committee. Wilson stated that in the prior year various troubling Sheriff’s Department items came before his committee, so he decided that a thorough audit was called for to see if other aspects of the LASD’s performance were similarly inadequate. The establishment of the partnership and then the LASD getting the entire contract were during the years I attended Metro Board meetings. As I watched this unfold, it became clear that the entire process was extremely political and had little to do with providing the best policing services for Metro patrons. 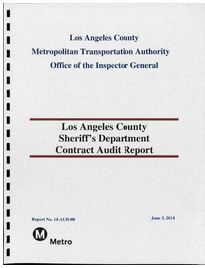 The audit and the follow-up peer review, facilitated at the request of Metro CEO Art Leahy, by the American Public Transportation Association (a trade group), confirm my long-held suspicions of how poorly the LASD has been fulfilling the contract. It is dismaying that the staff report for the meeting Thursday glosses over the depth of the problems with claims of recent improvements and opportunities. This begs the question: would these recent improvements have occurred if Wilson had not requested the audit? These improvements are undertaken as the contract is coming up for renewal, and LASD no longer can assume renewal will be a rubber stamp. LASD’s creation of a Transit Policing Division looks like an acknowledgement the LASD has not been doing the job, and are hastily trying to clean up their act. I have to imagine that the three responses to the request of interest regarding the new transit policing contract are making LASD nervous. If LASD is one of the three, who are the other two? The current LASD contract extension expires on Dec. 31st. I will be curious how this all plays out. I will be attending the meeting on Thursday, and will use my 60 seconds of public comment to remind the Metro Board that they should have been asking questions years ago about this situation. Metro boardmembers shouldn’t expect to squirm out of responsibility with self-serving blog posts that laud “tough reforms” when the Board deserves no credit for allowing this mess to fester. I expect that boardmembers may be likely to launch into their best Captain Renault imitations with protestations they are “Shocked! Shocked! Shocked!” at the audit’s findings! Then they will attempt to make a big deal about improvements and avoid questions about how they happened and who is to blame for the years of mis-management and sub-standard performance. BTW, though it is a public document, the actual full audit document heretofore hadn’t been made available online. I had to go down to Metro’s Record Management Department with a flash drive to obtain it and then post it at this link provided above. Because I thought we deserved to be able to see the report instead of relying on descriptions in staff reports and coverage in the media. Not having read the actual document (yet) – could Dana (or anyone else) tell me what sort of problems it spells out? The staff report for Thursday in section 3 “Results of the evaluation” summarizes the findings. 50 recommendations were made and supposedly Metro and LASD agreed with most of them and “corrective actions initiated where appropriate”. One troubling discovery is in 2008 a consultant reviewed Metro security and the recommendations he made were not implemented. How to make sure the current audit results in real improvements and put in place a process where henceforth the sorts of deep deficiencies described in the audit aren’t allowed to remain unaddressed is the key management and Board oversight issue that I will be looking for some answers regarding at the Thursday meeting. I just posted above, but I should note the problems are both in terms of methodology, tactics and administrative. It found profound problems and shortcomings at multiple levels. Metro Extends Sheriff Contract 6 Months; What’s In Metro Policing’s Future? Metro's new policing contract is hopefully a first step toward effective responsible policing. For the enormous amounts of money Metro spends on policing, passengers and taxpayers deserve better.